Breakfast is by far my favorite meal of the day. Over the last year I have actually been making time for it – normally I am just a weekend brunch person. I have a few favorite places we go in the weekend, Guglhupf (a german bakery – an amazing cafe with a great outdoor atmosphere), La Farm Bakery (a French Bakery), then of course an easy, hassle-free family option – iHop (I know, I know, started off well 🙂 but I do like the breakfast sampler). I also have a few favorite recipes – a couple of savory ones which I will post next, you are in luck though if you have a sweet tooth. Let’s start with the sweet – you’ll see the european influence. My husband and 5-year-old love these crepes. They take very little time and we actually have enough left over to have them again a couple of days later. 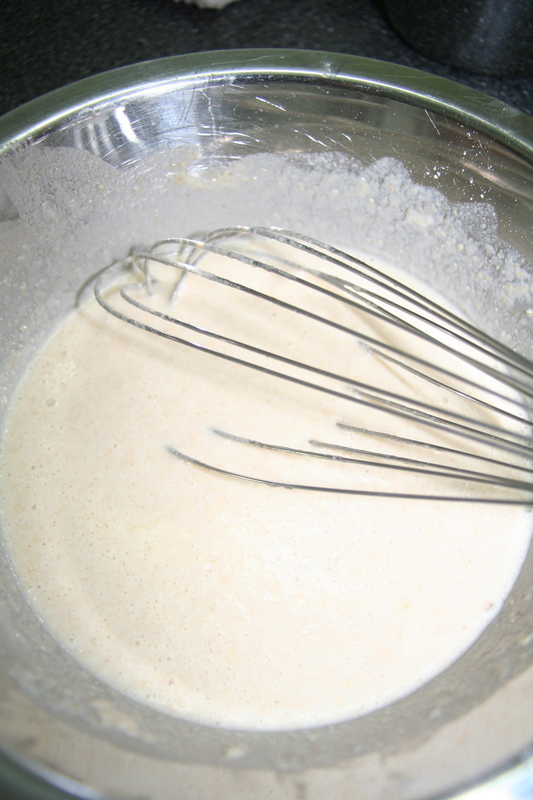 Add the first 6 ingredients in a bowl and whisk it until mixed, set aside. Heat a non-stick fry pan on medium heat. 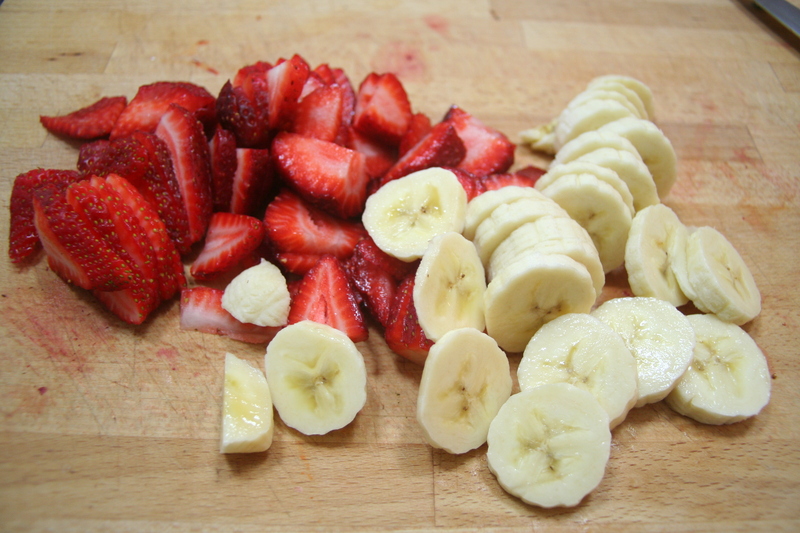 Make sure you have the strawberries, banana and Nutella close to the element, you will need to move fast. My pan does not need any butter, but if yours does, add some before adding the mixture to ensure an easy flip. Use a 1/4 cup soup ladle and spoon the crepe mixture into the fry pan, move the fry pan in circular motion to spread and thin the crepe mixture. 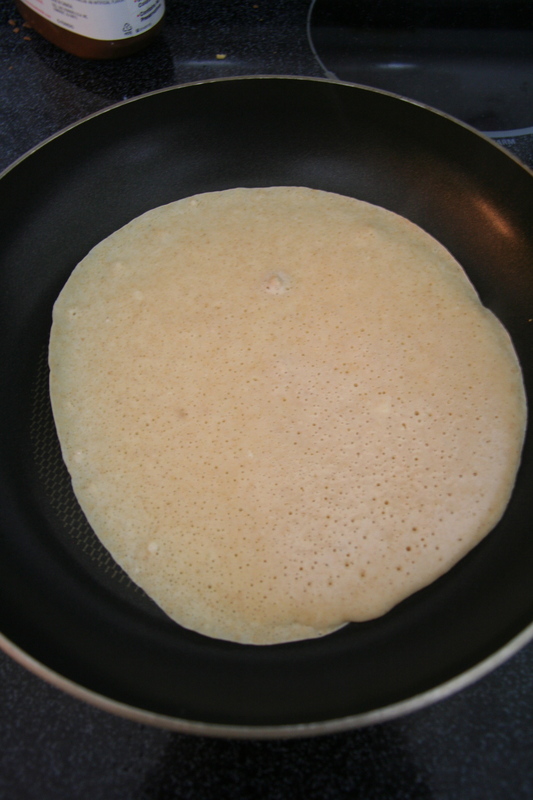 Once it starts to bubble all over, flip the crepe (I use another crate and barrel tool – spatula). 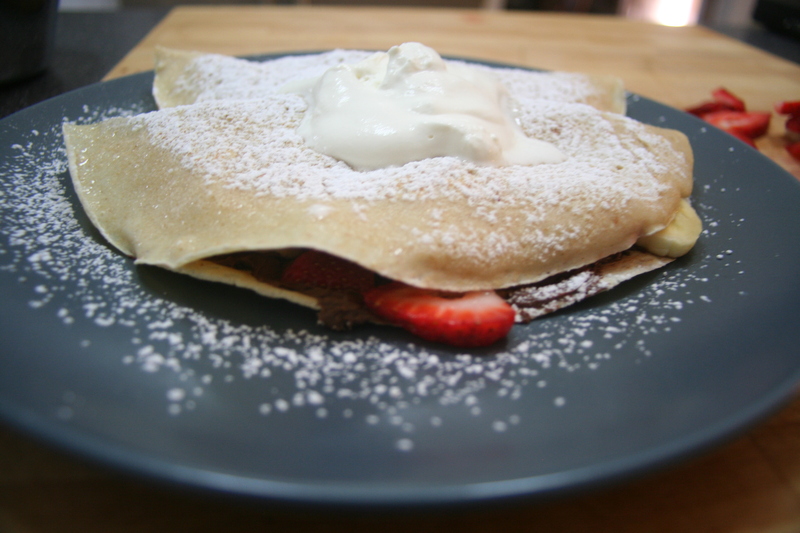 Quickly spread a tablespoon of Nutella on 1/2 the crepe, add 1/4 of the strawberries, 1/4 of the banana) – I leave the crepe ~1-2 minutes just to turn a slight golden color on the bottom. 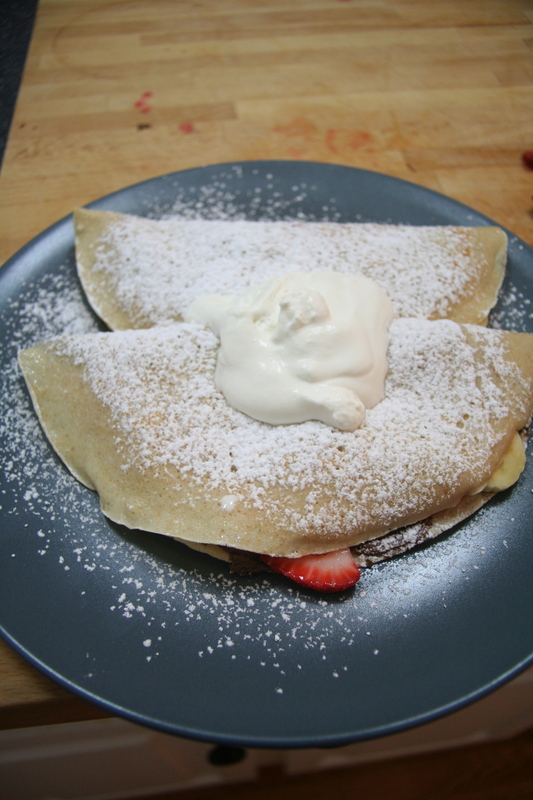 Platter the crepe and fold over the top, using a sift sprinkle icing sugar over top and a dollop of whip cream. Serve immediately. Repeat for other crepes. NOTE: For me, I prefer a lighter version and I omit the Nutella and cream – you won’t believe the strawberry taste you get :-). NOTE: We have also tried these with caramelized apples (apples cooked in butter and brown sugar) – very good as well. This recipe works great for the working week. It stores well in the fridge for 5 days – due to the apple juice. The night before, add the rolled oats and apple juice together in a medium-sized bowl. Place in the fridge until morning. 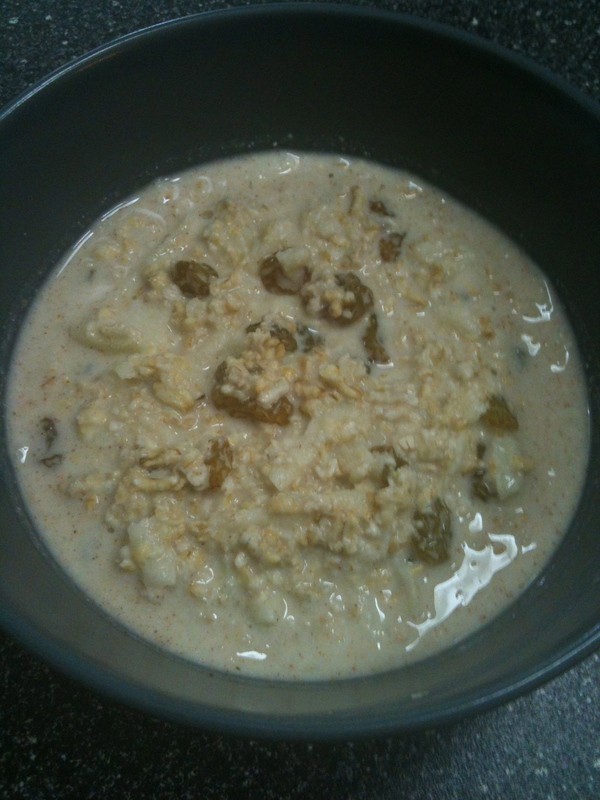 In the morning, added freshly grated granny smith apple, greek yoghurt – stir. Add other ingredients, mix again. I tend to use sultana’s (golden raisins) as my dried fruit. NOTE: You will find that the mixture will thicken slightly by day 2. If you want it thinner add milk; if you want it thicker add less apple juice. This entry was posted in Uncategorized and tagged banana, bircher muesli, breakfast, crepes, food, granny smith apples, greek yoghurt, nutella, oats, recipe, strawberry on September 6, 2012 by mlwilkie.